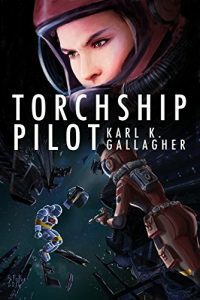 Karl Gallagher’s Torchship was a fine novel, but it took some getting used to. Gallagher used the slow immersion technique to explain how his intricate universe works, only gradually revealing all of the factions at play and how they interact. Add to that the hard-as-nails setting for the tech, and a lot of what happens in the first half of the book only made sense to me retroactively. Things happen, and in many cases, the explanation comes later. With a full novel under the reader’s belt, the sequel makes for a much more straightforward novel. The three-way conflict between the rogue AIs who genocided human life on Earth, the more anarchist-leaning analog tech Disconnected Worlds (the Diskers), and the totalitarian computer worlds of the Fusion puts the titular character, one Michigan “Mitchie” Long, bouncing back and forth among them. A native Disker, Mitchie burns for vengeance against the Fusion, and isn’t above using the AI’s against them, but even she recognizes that humanity’s only chance of survival lies in uniting to combat the AI threat. Where the first novel followed the journey of the freighter ship Fives Full through a series of adventures that all led up to a big confrontation first with the AI, then with the Fusion, this novel feels more like one giant arc. With the secret of Mitchie’s real job revealed, the action can focus on how she serves the Diskers as the pilot of a tramp freighter whose most valuable cargo is the secrets Mitchie carries around the galaxy. She is, as one character puts it, “nasty, brutish, and short”, an agent for the Diskers who always seems to survive as she continues to push her luck, but rarely comes out unscathed. Although she may suffer from a bad case of Plot Immunity, Mitchie makes for a great central character. She is slight of stature and frame, and so rarely ever wins direct physical confrontations. Instead, she relies on a quick wit and a savage ferocity and a few key allies to see her through physical danger. Although her ruthlessness at times crosses over the line and makes her an offputting character, this is mitigated by the high stakes involved and Mitchie usually redeems herself with rare moments of regret and guilt. It’s also safe to say that Torchship: Pilot doesn’t suffer from the Second Act Doldrums. In many trilogies, the second book feels like an exercise in setting up pieces and jockeying for position and just marking time until the real action can start back up again in the third act. That does not happen here. The action ramps up, every faction makes considerable progress toward their goals, and the ending of the book – although a bit abrupt – would make for a suitable place to stop reading…if you can resist finding out what really happened on Earth the day the AI’s betrayed humanity.